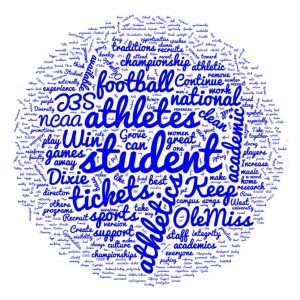 Word cloud highlighting Athletics feedback collected during the Town Hall Meeting on Aug. 29, 2016. Athletics is often called the “front porch” of a university. Our successes on the field play a big role in elevating the Ole Miss brand. Athletics captures the hearts of people and brings them to campus where they experience the full richness of our institution. And our athletes aren’t just competitive on the field — our student athletes posted the highest cumulative GPA in school history last year and nearly 80 student athletes were named to the 2016 SEC Spring Academic Honor Roll. Eight of our current or former student athletes even competed on the world stage at the 2016 Summer Olympics. Athletics Excellence is important to our growth, visibility, ability to raise funds and ultimately, the overall success of our university. During the Town Hall, we received 61 ideas about athletics excellence across the following 6 broad categories. Click on each category to read all the individual ideas submitted by UM community Town Hall participants.